Cited as a benchmark and classic version of vermouth by the Oxford Companion to Wine, Punt e Mes (Poont eh Mehss) is one of the world's most popular red vermouths. Not overly cloying like the many commercial vermouths, it can be served straight up, used to make red Martinis, mixed with gin to make classic Italian cocktails like Negronis and Americanos, and it is also excellent when served with fruit juices, sparkling mineral or tonic water. 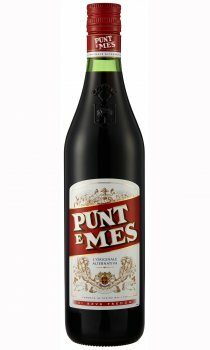 With an aroma of wormwood and hints of bitter herbs, Punt e Mes is a vermouth in its finest form. Its name ("point and a half") in the dialect of Turin, came from the day when an absent-minded stock exchange agent called out the trading floor term in old man Antonio Carpano's bar, asking for a vermouth with a half-dose of bitters. The concoction that evolved as Carpano Punt e Mes, is coffee-coloured, and based on white wine aromatised with a secret recipe of dozens of herbs and spices. Served over the rocks with a splash of soda, it is exotic in a surprising way: first a taste of cola-like sweetness, then sharply bitter at the back of the tongue, with a complex web of tastes in between. The most intriguing of all vermouths - neither sweet nor dry. A disappointingly Dr.Pepper-like first hit opens up into cloves and vanilla before leaving you with the oh-so-grown-up sensation of having actually enjoyed the bitterness of burnt caramels and Zippo\'d orange zest. Try a Cornwall Negroni: 2oz gin; 1/2oz Punt e Mes; 1/2oz Campari; 1/2oz sweet red vermouth (eg Martini Rosso). Two dashes of Orange Bitters (Fee Bros. better than Angostura, in my view). Twist of orange. Try this in the following mix - one part gin to two parts Punt e Mes to four parts Cinzano Bianco - very drinkable but lethal if taken in large quantities! It is known as College cocktail, invented by Bishop Tickle at the English College in Rome. Keep some in the fridge! Punt e mes is a really great, very robust, sweet Vermouth. Most similar to Martini Rosso but with a distinct, spiky bitterness. It really makes itself heard in mixed drinks, one of the few sweet Vermouths worth trying in place of Martini Rosso in a Negroni. Also makes a very distinctive Manhattan and Martinez. Dry herbal notes of wormwood, thyme and anise among others lead to a soft sweet richness punctuated by a welcome bitterness.